Sociologist, research and communication consultant, progressive Democrat, boomerbabe, defender of reason. 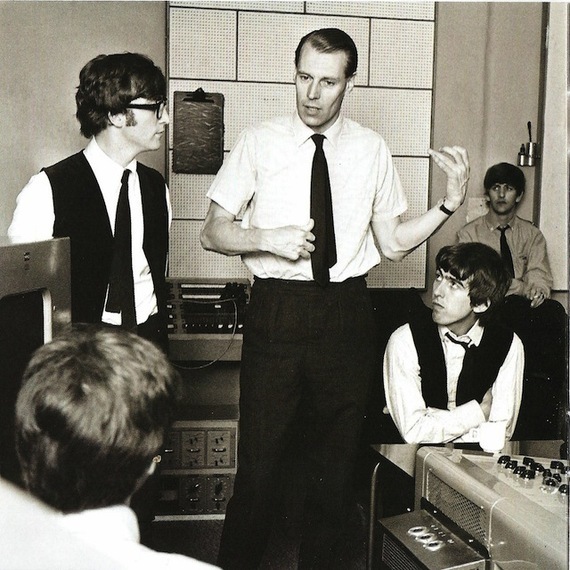 Like many music fans, I was saddened to read of the passing of Beatles producer George Martin, a man many boomers first became aware of while scrutinizing the cover of Meet the Beatles in January 1964. We didn't necessarily know exactly what a producer did, but we knew he had something to do with the sounds we were hearing and the experience we were having. Indeed, growing up with the Beatles, engaged with their nonstop flow of music, images, and ideas between 1964 and 1970, was the defining boomer experience, a unifying focal point for millions of boomers now between fifty-five and seventy, give or take a year or two. While Beatlemania seemed to happen overnight in the US, it was only later that we learned about all the hard work and disappointment the lads from Liverpool had to endure before appearing on The Ed Sullivan Show. And now, it's much later, and the story of how the Beatles came to be the Beatles is the stuff of legend. Looking back, fans of all ages marvel at the serendipitous encounters that drove the band's improbable story. Their meeting with George Martin was one such encounter. Beatles manager Brian Epstein had tried to sell his cheeky lads to every record company in Britain, but kept getting turned down. "Guitar bands are on the way out," said one executive at Decca (who apparently learned his lesson and soon signed the Rolling Stones). Dejected but determined, Epstein arranged an audition with Martin, a classically trained musician who had been producing comedy records at Parlophone, a small British label. Martin and the Beatles quickly developed a natural rapport based on a shared sense of humor and deep admiration for the comedy of Peter Sellers, Spike Milligan, Peter Cook and Jonathan Miller, whom Martin was producing. Close to two decades older than the Beatles, Martin, like the Beatles, was very intelligent, easily bored, and playfully creative. Martin's decision early on that they be a foursome without an identified front man added to the appeal and intrigue of the whole package, encouraging girls to pick a favorite and encouraging boys to project themselves into their buddy-like esprit de corps. Along with their quick rapport came trust and respect, established from the start when Martin suggested replacing drummer Pete Best--which they'd been itching to do anyway--and accurately predicting that speeding up the Roy Orbison inspired "Please Please Me," would make it their first big hit and give them their signature early sound--infectious, joyful, energy. George Martin was the master of the splendid flourish--those moments of perfect, unexpected detail that, for reasons that can't be rationally explained, allow a song to find its way into your soul. Already a bit of an outside-the-box producer, but with classical training, Martin made judicious suggestions that enhanced the Beatles' music in ways that would never have occurred to them. Tinkering at the console, and teaching John, Paul, and George to do the same, the Beatles' music grew to greater greatness. The exquisite Motown-like tambourine on "Run For Your Life"
The staccato violins (inspired by Bernard Herrmann's film score to Psycho) on "Eleanor Rigby"
The rousing brass arrangement and organ on "Got to Get You Into My Life"
The marching band and sound effects on "Yellow Submarine"
The honky tonk piano on "Lovely Rita" and "Rocky Raccoon"
The "psychedelic" backwards vocals on "Rain"
The random reassembling of cut up tape snippets and Wurlitzer organ for the chaotic circus flavor on "Being for the Benefit of Mr. Kite"
The orchestration of world music on "Within You Without You"
While music fans of all ages should appreciate Martin's enormous contributions to recorded music--as a producer, conductor, arranger, and musician--boomers may remember Sir George Martin as the person responsible for some of the most enchanting moments of our childhood and adolescence.